Starting from only £0.75 per chair dressing! 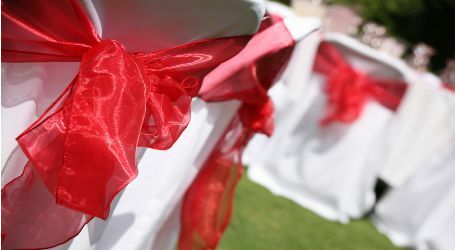 We have a range of exclusive chair sashes, chair bows and wraps that will complement your theme and also your chair covers for hire. You can also hire any of the above without a marquee. Gently drape and flow down the back of the seat for that contemporary feel. Traditional bows tied at the back of your seat to give a sophisticated finish. Wrap around and elegantly tie at the back of your seat. To find out more and check availability Get Your Quote Here. How we ensure your event is dressed immaculate. All items are washed and cleaned before each event. Each item is hand ironed before your events. We always deliver and collect. 1. Full Service – Save yourself time and stress. Our team will deliver, set up and collect. So you can focus on your event. If you’re on a budget the ideal option is D.I.Y hire. 1) Order by phone, email or by using the quote form. 2) Depending on your selected service your seating will be dressed or items delivered prior to your event. 3) For DIY services a collection bag will be supplied for the used items. 4) After your event all items will be collected. To check for availability Get Your Quote Here for your chair sashes, bows and wraps. For our full category range see our marquee equipment. To purchase any of the items listed contact us for more details.